“Edge to Insight – Using Device Data to Define Your Process”. The advent of digital transformation in the process and manufacturing industries has been a game changer for many, a source of confusion for others. 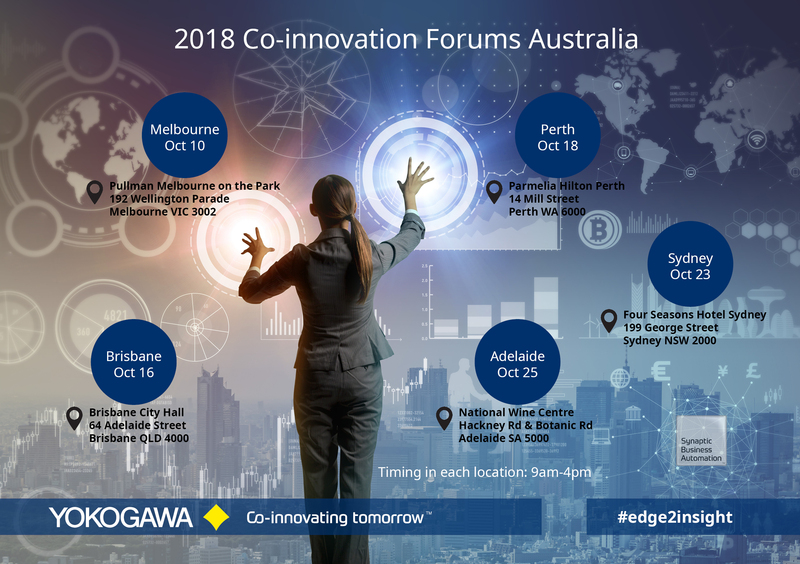 Join us at the 2018 Co-innovation Forums where we debate some of the most challenging issues facing plant personnel, as technology developments promise to herald a new era in productivity and performance. Engage with global and local industry experts plus end users from a range of industries who collectively look to tackle these challenges from the field level up. Assess the potential for improvement of your process as we address challenges and opportunities from the Edge, through the Plant to the Cloud. Gauge the impact on Plant Operations & Control, Asset Management and Analytics & Business Information as topics are debated around real-life applications. Click for the Melbourne agenda. Click for the Brisbane agenda. Click for the Perth agenda. Click for the Sydney agenda. Click for the Adelaide agenda. Save the date and watch out for further details. For any questions please contact marketing@au.yokogawa.com.